Paul Hornung was the type of player the National Football League hadn't seen before becuase he was able to score at an unprecedented rate as a rusher, receiver, and kicker. A member of five championship teams with the Green Bay Packers, he was elected to both the college and Pro Football Hall of Fame. 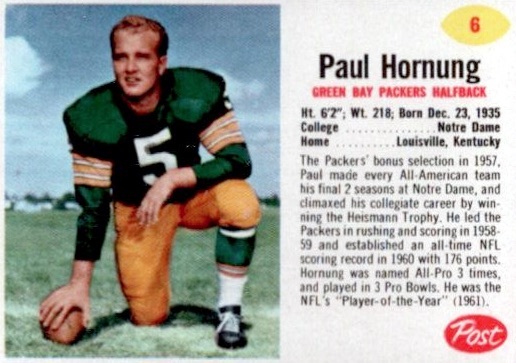 Check out ten of the best Paul Hornung football card appearances, including his very popular rookie card, as well as autographs from more contemporary sets. A Kentucky native, Hornung was a multi-sport star in high school and chose to attend the University of Notre Dame. Nicknamed "Golden Boy," Hornung was able to find personal success even when his team was struggling. During his Heisman Trophy-winning season of 1956, Hornung led Notre Dame in passing, rushing, kickoff and punt returns, punting, and also played defense, but the team ended up finishing 2-8 for the season. He is still the only player to win the Heisman for a team with a losing record. Shop for Professionally Graded Paul Hornung cards on eBay. The following year he was taken as the first overall pick in the 1957 NFL Draft by Green Bay where he excelled as a halfback. He led the league in scoring three consecutive seasons from 1959 to 1961. His 1961 season, in particular, was one of the greatest performances by a running back during the era of the 12-game season. Hornung rushed for 671 yards, added 257 through the air, scored 15 touchdowns, and was named the league's Most Valuable Player. His record of 176 total points stood until 2006 when it was broken by LaDainian Tomlinson. 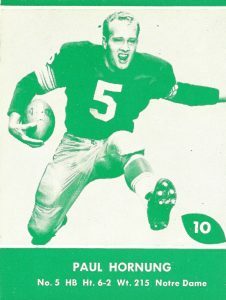 Along with Bart Starr's passing, Hornung provided much of the Packers' offense for four NFL championship teams in the 1960s, which included beating the New York Giants in back-to-back years. A key piece of the Packers run to Super Bowl I in 1966, Hornung had a severely pinched nerve in his neck that kept him from playing in the final game. The injury would ultimately force him to retire during training camp the following season. Hornung's resume is unique in football history as he is the only player to win the Heisman Trophy, be the top pick in the draft, win the NFL MVP, and earn spots in both the College Football Hall of Fame and Pro Football Hall of Fame. He even has an NCAA award named after him which is given to the most versatile player in college each season. Although early football cards were not as plentiful for Hornung, he still has quite a few that are worth noting. A few cardboard options that didn't quite make the list include his appearances in three out of the four Philadelphia football sets. Found in the Philadelphia releases from 1964, 1965, and 1967, his '64 card includes a rather intense facial expression of a player in the heat of the action. Other interesting choices include the Collector's Edge sets from the mid-1990s where Paul is found in the numbered Time Warp insert. Hornung is featured with contemporary defenders like Chris Zorich and Kevin Greene. In 2005 Upper Deck Ultimate Collection, collectors can find a dual autograph card featuring Hornung with legendary Packers quarterback Brett Favre. 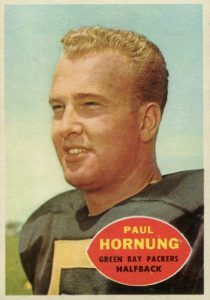 Given his relevance and team success, Paul Hornung football cards are some of the most popular NFL releases from the late 1950s and early 1960s. Narrowing the list and assigning rank was largely based on card value along with card design and the intention to build a comprehensive collection. The Packers Lake To Lake set is known for its bright green design featuring a total of 36 Packer greats. While several players were short-printed, it appears Hornung's card was not, giving collectors a chance to pick up a unique non-Topps card at a fairly budget-friendly price. The set was issued by a Wisconsin dairy and the reverse side of the cards prompted collectors to cut a portion of the card off and send it in with shipping and handling to receive prizes. Five card pieces and $.75 would get you a patch, player figure, or yearbook while 20 card pieces and $5 would land you a football. Topps inserted just one of these "Football Bucks" bills into each box of 1962 Topps Football, making them a fairly rare find today. 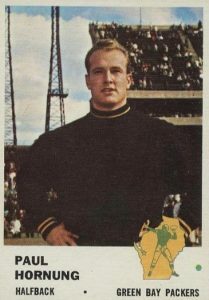 Hornung is one of four Green Bay Packers featured in the 48-bill set along with Bart Starr, Max McGee, and his backfield partner Jim Taylor. Both Starr and McGee are featured as $1 bills, while Taylor is shown as a $5 bill and Hornung rounds things out as a $10. On the right side of Hornung's portrait, you will notice a sketch of Green Bay's City Stadium is also included. Before Lambeau Field was named in honor of Packers founder Curly Lambeau in 1965, it went by the simple name of City Stadium. After Post debuted with baseball trading cards on their cereal boxes in 1961, they expanded to football cards the following year. Of the 200 total cards in the set, some players were featured only on the less popular Post cereal brands like Post Toasties and Grape Nuts. Those cards have become rare to find as not many fans clipped them from the boxes. Hornung's card is not as limited and card value can vary greatly between well-cut and roughly-cut examples. 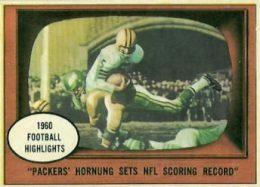 Along with Hornung's base card from 1961 Topps, which is featured below on the left, he also has a "Football Highlights" card detailing his amazing season and the setting of a new single-season scoring record. Hornung's 176-point total for the 12-game season surpassed Packer Don Hutson's record of 142 points. The Football Highlights cards are done in a style reminiscent of the 1955 Bowman baseball cards that feature the players' images placed inside a television screen. 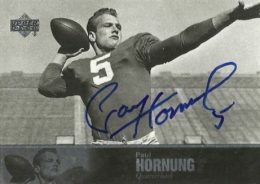 For fans of the Fighting Irish, you can find a great Paul Hornung on-card autograph in 2011 Upper Deck College Legends. Hornung is frequently referred to as the best athlete to ever play at Notre Dame and his card features a black-and-white photograph from his college days. Along with excelling at football, Paul also played on Notre Dame's basketball team but his struggling grades pushed the school to ask him to focus on only one sport. Clearly college sports have changed since then. 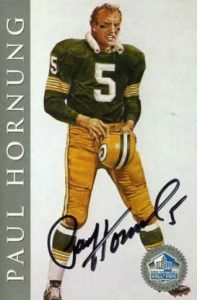 Hornung wore #5 during both his college and pro days and his number is unofficially retired by the Green Bay Packers. Fleer's first set of football trading cards, issued in 1960, only featured players from the American Football League. It wasn't until the 1961 Fleer set that Hornung and other NFL players were included in a Fleer product. 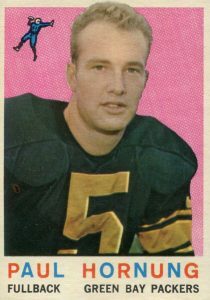 Worth noting, all the cards for the Packers in the 1961 set feature an incredible error. The Packers logo of the quarterback throwing a football while standing inside a silhouette of Wisconsin is a mirror image of what it actually should be. It's amazing that the error got passed the editors of the set but it makes for an interesting oddity. Packers fans looking to find an on-card autograph of the "Golden Boy" have multiple options as Hornung has been a frequent signer in many high-end sets, including recent releases like 2016 Panini Prime Signatures and 2015 Topps Museum Collection. A particularly beautiful card showcases an original Hornung painting that be found in the 1998 NFL Hall of Fame Signature Series. The set, sold as a single collection, included 116 NFL Hall of Fame members who signed these art cards and the production run was limited to just 2,500 sets. Proceeds went to assist Hall of Fame members who were experiencing financial difficulties. 1960 Topps featured only NFL players as Fleer had the license for AFL players that year. The reverse side of the cards offered a "Football Funnies" section that contains a cartoon joke which could be viewed by rubbing a coin on that part of the card. Of course, collectors have placed a premium on those cards that haven't been rubbed. 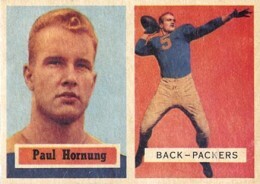 The joke on Hornung's card references the fact that the Packers uniform at the time featured no logo on their helmets. It includes a Packers player wondering why people are laughing at him as he stands next to a sign that reads "this space vacant." 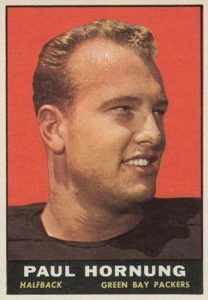 Because Topps did not include Hornung in the 1958 set, collectors need to skip ahead to 1959 Topps Football for his second NFL card. The release is famous for its alternating red-and-blue lettering on the player's name and Hornung is featured in a portrait design with a hot pink background. Similar to the illustrations added to the 1938 Goudey baseball set, small player figures were drawn in the backgrounds of the cards. At first inspection, you might think that the 1957 Topps Football set could have been a throwback to the 1941 Double Play baseball set which featured two different players on a single card. However, it is just two photographs of the same player, with one portrait shot and one action image for Hornung. The portrait side gives you a good idea of how he earned the nickname of "Golden Boy" with his blonde hair. Graded copies of Hornung's rookie in near-mint and better can top $2,000 at auction. 1999 Danbury Mint Paul Hornung #22 Encased 22kt Gold Packers Football Card WL4. Also, the “small player figure” represents a Packers team logo. The ’59 Topps player cards all had team logos in the upper corners. PAUL HORNUNG 2014 PANINI ABSOLUTE INK AUTOGRAPH AUTO #20 20 -PACKERS! !